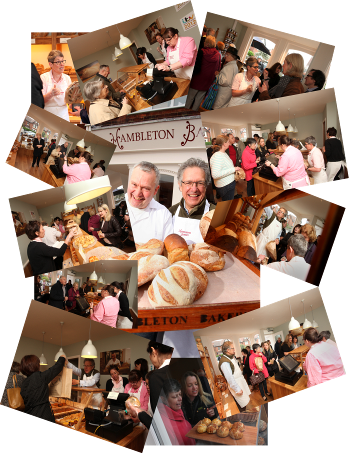 Hambleton Bakery (Britain’s Best Bakery 2012) opened a new shop in West Bridgford in April 2014. Owned by Tim Hart, who also runs city centre hotel and restaurant Hart’s and Hambleton Hall, the new shop was part of an expansion plan that had already seen the bakery premises at Exton in Rutland double in size to supply five shops and 60 farm shops, delis and restaurants throughout the region. Eden had previous experience working with Tim Hart (Hart’s Hotel & Restaurant and Hambleton Hall) and therefore had a good understanding of the brand and its ethos. Eden was tasked with delivering a marketing communications programme to support the opening weekend. The programme included organising a Melton Road Neighbours Event, establishing social media platforms, encouraging media attendance at the shop and generating coverage. Researched an extended media list to target, comprising 49 regional media outlets (print, broadcast and online), 14 local independent and self-submittal websites and magazines. Press releases were issued to select outlets via email and media interviews set up for the day. An exclusive preview event for all the Melton Road neighbours was held at Hambleton Bakery’s new shop with wine and hot drinks on offer as well as a selection of Hambleton products to sample. Tim Hart was present to meet and greet over 40 local business contacts that attended. Tweeted and updated Facebook leading up to the opening day and interacted with many excited people to promote the opening weekend. Eden issued press releases to local media to increase awareness and create a positive image. A leafleting campaign was organised and scheduled for 2 farmers’ markets in West Bridgford on the Saturdays prior to the opening. Tweeted throughout the opening day; and achieved 200 Followers in 24 hours. Coordinated four media interviews in the morning, with Tim Hart and Head Baker, Julian Carter. Eden interviewed customers to gather quotes for follow up press material. Eden researched a list of all the Rushcliffe Borough infant, primary and secondary schools with the Head Teacher as a key contact. A letter was drafted that offered Julian Carter as a visitor to talk to the children about the science behind bread and the important health benefits of producing real bread. Hambleton Bakery sold out on Friday 25th and Saturday 26th due to unanticipated high demand and served over 900 customers in just two days. Great coverage across regional media outlets such as Nottingham Post, Nottingham Confidential, Mumsnet, West Bridgford Wire and West Bridgford Local News plus Head Baker, Julian Carter, featured as the guest blogger for the Experience Nottinghamshire tourism website.